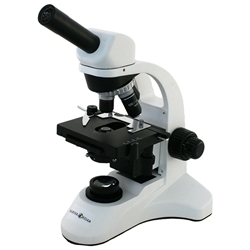 The Richter Optica HS-2M is a biological student microscope used in high schools. This model has cool LED illumination. Objective Lenses: DIN standard Achromat 4x, 10x, 40xR, 100xR oil immersion objectives are parfocalled, parcentered, color coded and mounted in reverse facing quadruple nosepiece. 30° inclined viewing head rotates 360° making it easy to share by more than one student. Includes: Dust cover and blue filter.